October 3, 1906 – The Chicago Daily Tribune decrees in its lead on this date, “Chicago is the baseball center of the earth.” [Chicago Daily Tribune, October 4, 1906] “Since last night a combination pennant pole, marking the site of Chicago has served as the earth’s axis, and around it something less than 2,000,000 maddened baseball fans are dancing a carmagnole of victory, while in every other city in the American and National leagues there is woe.” After the New York Yankees lose to the Philadelphia Athletics, the city realizes that the magic number has been reached, and the White Sox have clinched the American League pennant. In one week the team will meet its crosstown rival, the Chicago Cubs, in the World Series. At the end of July the White Sox were mired in sixth place. 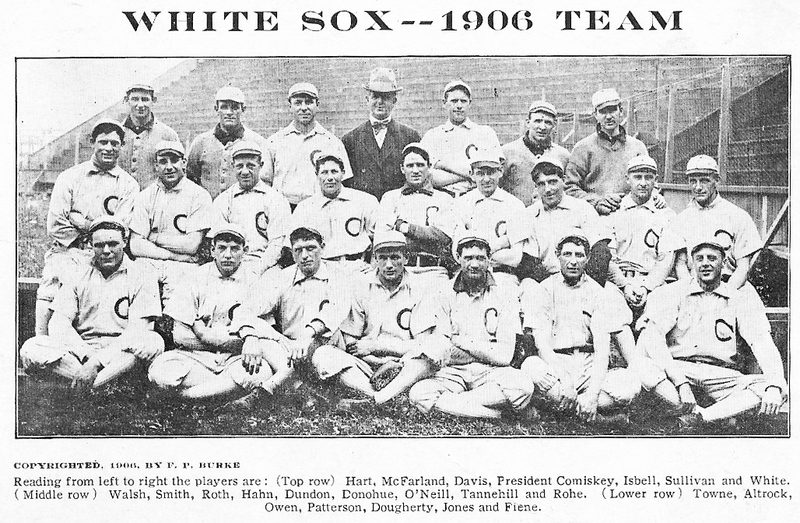 The paper observes that, despite the hopelessness of the situation, “People who cannot understand how the White Sox can win pennants should have visited the American league park and seen Comiskey and Jones working with their bunch of mediocre material, trying to make them into a pennant winning team. Now Comiskey has a theory that team play will beat individual ability. He was teaching his team the points.” After finishing the season with a team batting average of .230, the worst in the American League, the White Sox defeat the Cubs in the World Series in six games. October 3, 1885 – On this date the Chicago Daily Tribune reports on a letter that the Chief Librarian of the city has sent to the Chairman of the Council Committee on Buildings. The letter provides detail about the location of the city’s first library, housed in a converted water tank on Dearborn Street, just east of today's Rookery Building. Mr. Poole, the librarian, urges the temporary removal of the library to the new City Hall, just up the street on Washington Boulevard, citing the grave risk of the city’s entire collection of books being destroyed by fire. The present location of the library is "overcrowded already, many valuable books being in consequence stored in out-of-the-way corners for want of a place to put them.” The library has four floors and no elevator. On the fourth floor is a newspaper reading room of 3,292 square feet, a periodical reading room with 2,307 square feet, and a room for patent books and documents continuing 2,503 square feet. The floor below contains the main collection in 16,324 square feet of space. 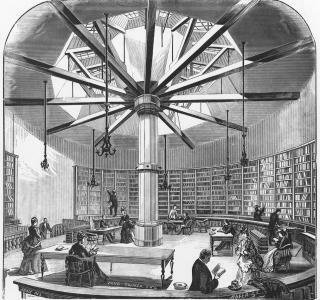 Since the collection of the library is increasing by 10,000 volumes a year and the threat of fire can not be ignored in a city that burned to the ground just 14 years earlier, Librarian Poole is a bit distressed that he hasnot received an answer from Alderman Mahony, to whom he had directed the letter. The book room of the "water tank library" can be seen in the engraving above.